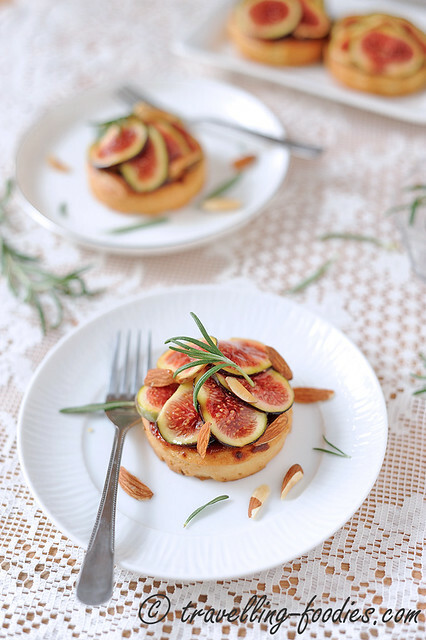 The initial intentions was to remake Sugino’s famed fig tartlets, which are very seldom seen in his pastry boutique in Tokyo. Not because he doesn’t enjoy making them I’m sure but figs are indeed very delicate to handle and they have very short shelf-life, not to mention a short season. Those who managed to taste Sugino’s tartelette aux figues are indeed very lucky. Alas the wish to remake his tarts was not meant to be. This season’s black figs are too small to be aesthetically pleasing if Sugino’s original composition was to be maintained. A reconfiguration of the layout has to be thought through but I was thinking to myself since I have to rework the layout, I might as well rework the entire composition. 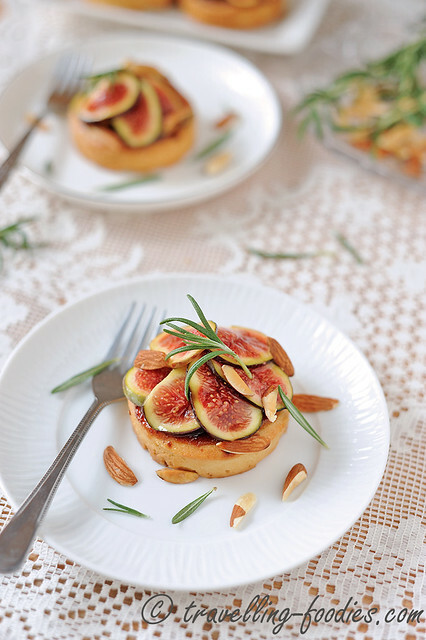 Then came the inspiration from “Duchess”, a fresh fig and rosemary tartlet from last year’s creations by the popular Parisian patisserie, Pain de Sucre. The composition of their tartlet is made up of “pâte sablée aux amandes, crème amandes noix et café, pulpe de figue au romarin, figues fraîches” but that is about all I know about them. 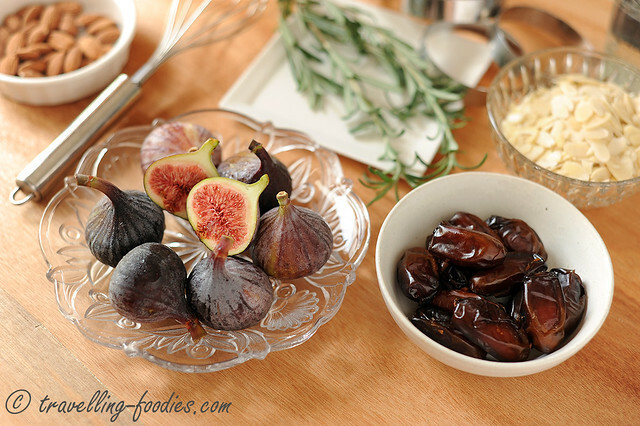 I am curious about the figs and rosemary pairing but I do not have enough fresh figs to make a compote out of it. So drawing ideas from this pairing, I used Sugino’s tartelette aux figues recipe and changed many of its components within with the idea of Mediterranean cuisine in mind. Almonds, greek yoghurt, rosemary, dates and of course figs are what I’d used as the “palatte colours” on the tart pastry “canvas”. The choice of figs is important as not all varieties are good for eating. Amongst those which are palatable, not all should be eaten fresh, but best dried to concentrate the sugars within. Black Mission Figs are one of the best varieties for eating because they are amongst the sweetest. But having very thin skins, they are not easy to work with. The black figs we have this season come from South Africa. I’d tried fresh figs from Brazil (yucky), Israel (so so), Turkey (inconsistent quality) and of course black Mission figs from California which are very very good. But I’d not eaten those cultivated in South Africa before. Curious to how they would taste, I bought a punnet and they turned out surprisingly sweet. Not black mission figs that kinda brix level but good enough to be enjoyed fresh. I’d swiftly went back to the supermarket the next day in hope to get more but alas all was not meant to be. The shelves was completed swiped out, save for one last punnet with 5 small figs sitting in there, which I’d bought in hope that they would be just as good as the previous ones and thankfully they are. I’d also decided to add dates as a component in these tartlets, part of it pulverised into the creme aux amandes which would then go on to become creme frangipane, while the rest are chopped coarsely and added into the creme frangipane directly for texture. To accentuate the sweetness of the dates, part of the milk component in the creme patisserie is replaced with greek yoghurt, first heated and steeped with rosemary. It is hoped that the acidity of the greek yoghurt would cut through the sweetness of the dates and later on, the fresh figs. Though Pain de Sucre uses a pate sablee for their pastry crust, I’m sticking to a pate sucree, using the leftovers from the feijoa and dark chocolate tartlets, just nice to make four tartlets for this little project. Creme amandes et dattes on the left and creme patisserie on the right, before these two components are amalgamated to form creme frangipane. The final mixture is left in the fridge overnight for the frangipane to mature. And on the second day, the tart shells are shaped, filled with frangipane before being baked until a lovely golden brown. 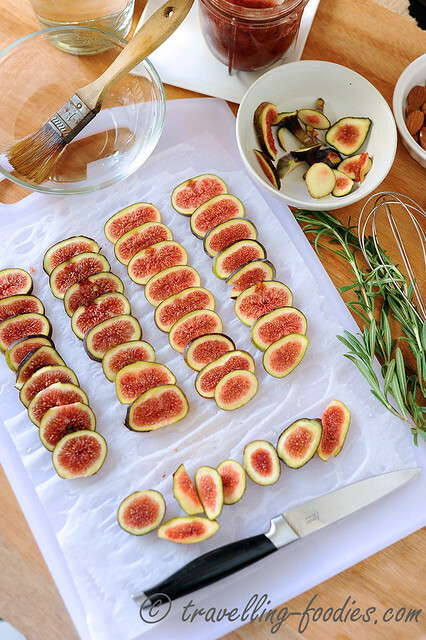 While the baking is taking place, the fresh figs have to be carefully sliced with the sharpest and thinnest knife one can find, before being gently macerated with rosemary infused syrup and kirsch. The same syrup was also brushed on the tartlets fresh after baking, for the syrup to be absorbed rapidly, before a generous coating of framboise pepins is applied. These are very Sugino components. The tarts are then assembled and plated. Not to forget some embellishment of toasted almond and fresh rosemary leaves whose aromas would be gently partaken by the diner while they enjoy the tartlets. In the case of these tarts, that would be me! Cream butter with icing sugar until pale and fluffy. Add beaten egg a bit at a time and mix in between additions. In a pot, add milk, greek yoghurt, sugar, vanilla paste and rosemary heat until small bubbles starts to form around the sides of the surface around the pot. Cover and leave to steep fo 20-30 min. In a mixing bowl, mix egg yolk, cake flour and cornstarch. Temper milk and yoghurt mixture into egg yolk mixture. Return to stove over very low heat and mix until thicken. Set aside to cool down slightly before clingfilm and set aside for later use. 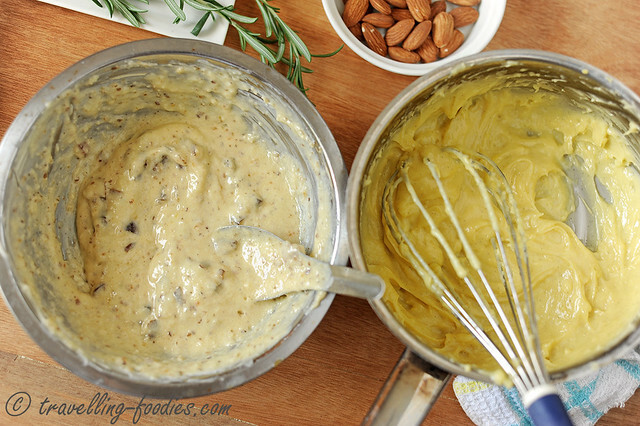 Pulverise almonds with 5 pitted dates until a soft and slightly moist paste is obtained. Cream butter with icing sugar at room temperature until pale and fluffy. Add the remaining ingredients and mix well to form a paste. To make creme frangipane, simply combine creme patisserie and creme d’amandes and mix well. Take care not to whisk and incorporate air into the creme frangipane. Cover surface with clingfilm and refrigerate overnight. Put all the ingredients in a small pot and heat gently until all the sugar has melted. Do not need to bring to a boil. Cover with lid and allow to steep for at least 30 min, preferably overnight until completely cool. 5 dates, pitted and chopped coarsely into morsels. To bake the tartlets, pipe creme frangipane into the tartlet shells and embedded chopped dates into the frangipane cream. Rest in the chiller for 30 min. Bake in a preheated oven at 170 degrees Celsius for 20 min until golden brown. 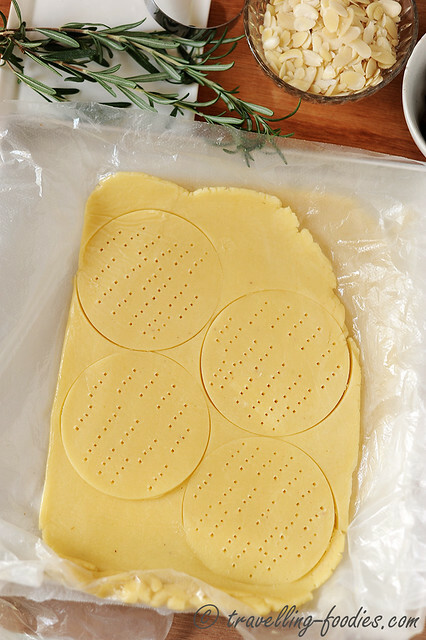 While the tartlets are baking, prepare the soaking syrup by mixing 20g of 30B rosemary syrup with 15g of kirschwasser. Cut the fresh figs into thin slices over greaseproof paper. Brush the surface of the figs slices very gently with some soaking syrup. Place the whole tray of sliced figs in the chiller for 30 min. When the tartlets are out of the oven, poke some holes on the surface of the frangipane filling to allow steam to escape. Brush generously with the remaining soaking syrup, followed by a generous layer of framboise pepins. Wait for the tartlets to cool down completely before assemblage. To assemble, lay chilled fig slices over the framboise pepins carefully. 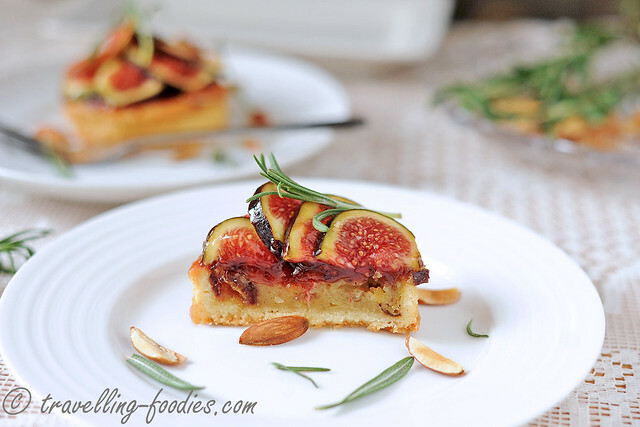 Brush the surface of the fig slices carefully with the apricot glaze and kirsch mixture. 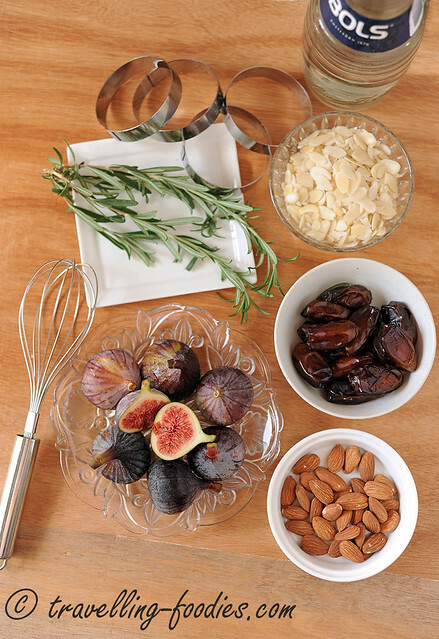 Garnish with some slivers of toasted almonds and fresh rosemary leaves. To serve, place a tartlet in a dessert plate, with some rosemary leaves freshly plucked off the stem and crushed slightly to liberate the aromas. This entry was posted on May 20, 2015 by Alan (travellingfoodies). It was filed under Food, Simple Eats and was tagged with almond, apricot glaze, creme aux amandes, creme frangipane, creme patisserie, figs tartlet, french pastry, hidemi sugino, kirsch, pate sucree aux amandaes, patiserie, patissier, raspberry jam, roasted almond, rosemary, sirop B, tarrtelette aux figues et romarin, tart. Beautiful post. Love the pictures of the figs. Figs are hard to photograph and when you get a great shot it is amazing. I like the use of Greek Yogurt.